In the middle of the seventh inning of the Baltimore Orioles’ game against the Arizona Diamondbacks two Friday nights ago, the public-address announcer asked the crowd at Camden Yards to stand and celebrate America’s diversity. Three singers then stood on the first-base dugout and did a rendition of “This Land Is Your Land,” the famous folk song written by Woody Guthrie. By the time the end of the third verse arrived — “All around me a voice was sounding, this land was made for you and me” — fans had joined in. In a tradition that dates to the aftermath of the Sept. 11 terror attacks in 2001, “God Bless America” is played in major league ballparks around the country, including in Baltimore, during the seventh-inning stretch of Sunday games. The song can also be heard during assorted holiday games, and the Yankees play the song during the seventh inning of every home game. But Baltimore is the only major league franchise to regularly play “This Land Is Your Land,” which it does at Friday home games. And the song, long considered an anthem of the left because of its populist themes, is meant to be more than a Camden Yards singalong. It is a subtle, yet intentional, message from the Orioles’ management that at the intersection of sports and patriotism, one size does not have to fit all. Fred Hellerman, the last surviving member of The Weavers, died on Thursday at 89. It was this musical activity, exactly the kind of “singing and dancing” Woody Guthrie writes about in “1913 Massacre,” and the political sympathies it suggested, that aroused suspicion during the Red Scare of the 1950s. Fred, along with Pete Seeger and Ronnie Gilbert, was blacklisted from performing in public. Like Pete, he continued to make music throughout the 60s and 70s and well into his old age. I wrote about “Old Man Trump” and the bigotry it denounces here, back in January; but I didn’t know about this recording until yesterday, when my friend David Goddy sent along an article about it in The Guardian. I don’t know about all that, but I figure David shared the song with me because “Old Man Trump” is a song from 1950 that addresses what’s going on today. It’s sort of a 2016 postscript to 1913 Massacre: a song that pushes back hard against greedy bosses who push people around, decide who’s in and who’s out, prey on people’s suspicions and stir up hate. Maybe this new recording will help people push as hard against the son as Woody pushed against the father. We started shooting 1913 Massacre before High Definition video and the 16:9 aspect ratio were widely used, and we kept shooting Standard Definition video and producing in a fullscreen 4:3 ratio even after HD and widescreen 16:9 became the default format. I once endured a screening of the entire film at the wrong aspect ratio. It was deeply disconcerting. Stretched across the big widescreen canvas, Calumet no longer glows like a pearl. Video artifacts multiply. People are dwarfed and their bodies are distorted in inappropriately comical ways. I could not sit still, so I stood. Then I paced. I screamed silently at the back of the crowd. Fortunately, the audience seemed tolerant and forgiving, maybe because the film was being projected in a crowded room and most people were at an odd angle to the screen and craning their necks to begin with. Please note: when playing your 1913 Massacre DVD on a DVD player, set your television’s picture settings to an Aspect Ratio of 4:3 (not 16:9). Most computers will automatically play back at the correct aspect ratio. Does 4:3 make our film look – gasp — dated? Yes, if dated means merely that it was made in a particular time and place. In that case, every film and work of art and piece of writing is dated. But if dated means more than that — passé, quaint, or expressive only of its time -– then emphatically, No. It’s a clueless question to ask about 1913 Massacre, which is in part a documentary about how the past asserts itself in the present. And it betrays an impoverished way of thinking about filmmaking and about art in general. New technology will not necessarily produce better filmmaking; I challenge anyone to prove it has. Good films just don’t have a shelf life. Ken and I talked about this issue just the other day. He reminded me that Russian film pioneer Sergei Eisenstein (in a 1931 essay called “The Dynamic Square”) advocated image formats that did not conform to industry standards, but were instead a fluid element of film’s language, suited to the dramatic demands of the story and to film’s evolving social function. Many experimental filmmakers have pushed the boundaries of filmmaking, and shown audiences new ways of seeing, in pursuit of Eisenstein’s idea. I don’t want to pretend that 1913 Massacre is a bold experiment in the 4:3 ratio, but in a way it is: every film is a visual and storytelling experiment within the aspect ratio it uses. The 4:3 frame in 1913 Massacre is dynamic: the camera here creates its own language and poetics; the frame opens a portal between past and present. What’s more, we could never have made this film had we abandoned the discipline of that 4:3 ratio. 4:3 is also intrinsic to the way the film approaches, presents and respects its human subjects and helps establish its directness and candor. Let’s also not overlook the simple fact that we persisted in 4:3 largely because we were shooting on a shoestring budget with makeshift kit, and we were getting great results in the field. We’ve flirted with the idea of converting our film to HD and a 16:9 letterbox format, but then, we realized, it would just look like everything else out there, which it should not because it definitely is not like anything else out there. Woody’s “welcome” is echoed by what Arlo has to say about his father at one point in 1913 Massacre. Near the end of our first interview, I asked Arlo what he thought his father found out about being “American” in the course of his travels. The film doesn’t include Arlo’s full answer — how could it! — so here’s that moment from our interview transcripts. Well, he found out that he was a human being. That he had shared feelings about the values of this country. He loved the idea that there would be a place in the world where people could come, people could be born, and it didn’t matter what color they were, what circumstances they were from, what religion they had, what traditions, who their parents were, who their girlfriends, boyfriends were — he loved the idea that people would rise above all these little petty things. That somewhere in the world there was a whole country of people who valued these ideas. Didn’t mean that not everybody in the government did by the way. It just meant that by in large most people understood, most ordinary people understood, that this was so. And not only that, he believed that if everybody spoke their own mind, and we actually had the tolerance to listen to everybody else speaking their mind, that the overall mind would lead us in the right direction. In other words he had faith in that if everybody could have their say, the country would be all right, and that we would go in the right direction, generation after generation. Not everybody believes that, even today. There are people who want to cut short other people’s speech. There are people who are afraid that if they say the wrong thing they’d be foolish so they don’t say anything. There are people who believe all kinds of crazy things. But he was convinced that if you let everybody speak—often—and teach them that speaking is—by speaking I don’t mean just talking. I mean speak by what they do, by where they shop, by what they wear, by who they are, by their friends, by all of these things that define us. If we are free to be ourselves a little more in a country where people are not only encouraged to be themselves but love the idea of being in a place where everybody is being themselves. He loved that. That’s why he loved Coney Island. That’s why he loved being there in the midst of all these millions of people running around, everybody different, everybody — you couldn’t even understand half of them, it didn’t even matter. You could still buy something from them, you could still hang out with them, you could still goof off with them, you could still make music with them. If you’re in Chicago, don’t miss Bucky Halker at the Filament Theatre this Wednesday, November 18th at 7:30PM, performing songs from his new CD Anywhere But Utah: Songs of Joe Hill. Bucky will share the stage with special guests the BS Brass Band and John Abbey. More information here, at Bucky’s site and here, at the Filament Theatre site. 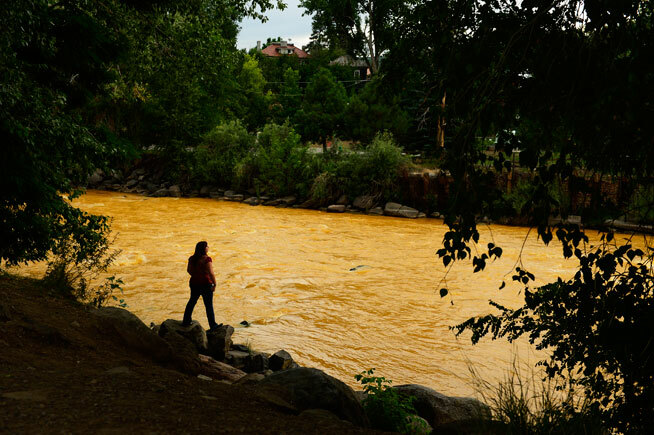 In this August 6th Denver Post photograph, Kalyn Green of Durango stands on the bank of the Animas River. Ken and I sometimes present 1913 Massacre as a film about “mining’s toxic legacy.” Over the past week or so, that phrase has started to take on new meaning. On Wednesday, August 4th, an EPA crew working with heavy digging machinery to install a drain in the abandoned and flooded Gold King Mine breached a debris dam and triggered the release of over three million gallons of toxic orange sulfide mining sludge into Cement Creek, which joins the Animas River at Silverton, Colorado. The Animas flows for about a hundred miles, through the San Juan National Forest and the town of Durango, to meet the San Juan River, a tributary of the Colorado River, in Farmington, New Mexico. Before the weekend, Farmington’s waters had turned orange. At the start of this week, the toxic plume of arsenic, lead, copper, cadmium and aluminum had reached Utah. Of course, there is much more to the story. The abandoned mines around Silverton — the Gold King, the Red and Bonita, and the American Tunnel — have been releasing hundreds of gallons of toxic wastewater every minute, every day, for nearly a decade. The Sunnyside Gold Corporation stopped treating the water in Cement Creek in 2003. The EPA was trying to remedy the problem; but the EPA and legal provisions in the Clean Water Act also stymied earlier efforts of good samaritan groups like the Animas River Stakeholders Group. Like it or not, this is our industrial heritage. 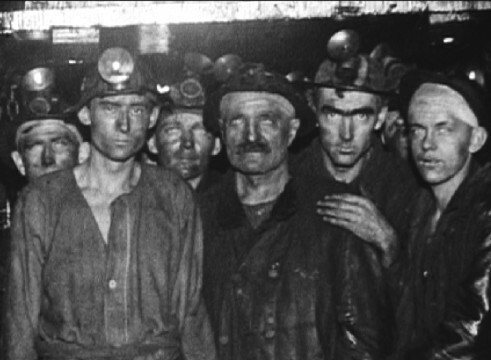 We have a responsibility to deal with the toxic legacy of mining’s past. At the same time we ought to remember that mining, and especially non-ferrous or sulfide mining, still poses a serious threat to American waters. Sure, mining and water treatment technologies have improved. But “treating water,” as the EPA’s Steve Way put it in 2014, “is a forever decision”; and neither industry nor government demonstrate unwavering commitment to that decision. So we have yet to clean up the mess left by mining companies that operated in the last century; and we continue to permit risky mining operations that will contaminate groundwaters and are likely to kill rivers, decimate wetlands, and pollute our waters. As people in the Lake Superior region — where our film is set, and which in recent years has witnessed a new run of exploration, leasing and mining activity — watched the Animas disaster unfold, many expressed the same thought: “imagine this coming down the St. Louis River.” “We can’t let this happen to the Boundary Waters.” In the Upper Peninsula, where Lundin Mining is now making a bid to expand sulfide mining operations to the headwaters of the Yellow Dog River, people are worried that today’s mining will irreparably damage waterways that managed to escape, or have just begun to recover from, yesterday’s destruction. The Animas River disaster serves as a stark reminder of how extensive the damage already is, and how much we still have to lose. 1 Comment - Leave a comment! Ever since Ken and I finished 1913 Massacre, I’ve been watching and learning about the resurgence of mining around Lake Superior. I’ve done some research, talked to some good people, and made a few informal scouting trips to the Lake Superior region, to see if I might perhaps produce a sequel to our 1913 documentary. So far, I haven’t discovered the film that I want to make, can make or must make about the new mining; and when it comes to independent documentary, all three of those, the will, the ability and the necessity are — for me, at least — essential. Finding the film one must make probably matters most of all. So, after our first couple of trips to Calumet, it became imperative that Ken and I make 1913 Massacre. Our sense that this film had to be made, and that we were the ones to make it, was, at times, the only thing that kept us going. We were hooked, ensnared, done for, in the grip of an often wonderful and at times taxing necessity. There’s already a lot of exploration, leasing and new mining activity around Lake Superior, and things are just getting underway. I am still finding my way, doing my best to keep up with the complex situation and trying to get hold of the narrative, and I’ve written somewhere in the neighborhood of forty or fifty blog posts about the new mining. Stepping back for a moment, I have to admit I don’t know where exactly all this is leading, or if it’s heading anywhere definitive at all, but it’s in some way a continuation of the journey I started when I followed a Woody Guthrie song to Michigan’s Upper Peninsula and the work Ken and I did together to produce 1913 Massacre. In fact, much of what I’ve written so far reads, at times, like a long postscript to our film, and I still think our film about 1913 speaks powerfully to the situation around the Lake today, so I thought I’d share those blog posts here, if only to connect formally the film and its postscript, past and present. 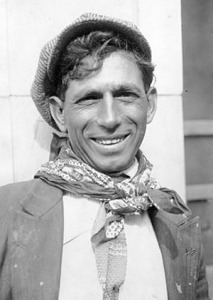 Pete Katsulis, who assumed leadership at Ludlow after the death of Ludlow Colony leader Louis Tikas. Now there is an independent documentary about the Ludlow Massacre. Palikari – Louis Tikas and the Ludlow Massacre, directed by Nikos Ventouras and produced by Lamprini Thoma. We haven’t yet seen the film, but it sounds as if the filmmakers take an approach in Palikari akin to the one we took in 1913 Massacre, exploring the story of the strike and the brutal murder of Ludlow Tent Colony Louis Tikas through oral histories and family traditions. You can read an interview with producer Lamprini Thoma about Palikari here. 3 Comments - Leave a comment! Have a great Labor Day. And don’t forget what it’s all about.